You may remember Cube World. I... Think I do? Released back in July of 2013, Cube World looked to be The Next Big Thing. A Minecraft-killer set in a Legend of Zelda-esque open world with quests and mobs and bosses and loot. Unfortunately the clock doesn’t stop for anyone; exactly three years have passed since then, and it’s time to move on. To say that Cube World’s development has been unorthodox would be an understatement. Developer Picroma released Cube World as an alpha in July of 2013, but since then it’s remained mostly silent. Shockingly, the last update to Cube World was released on July 23rd, 2013. To put this date into perspective, the game itself launched as an alpha on July 2nd of the same year. The game received a minor patch to some functionality 21 days after the game first launched and hasn’t seen a single new update since. But never fear, Cube World fans! Wolfram “Wollay” Von Funck, developer of Cube World would like you to know that the game is still in active development, and hasn’t been cancelled or shelved in any way at all. Just look at all of these Instagram posts showing off new and updated features to the game! 6 weeks ago, a currency system was being worked on. 11 weeks (almost three months ago,) new combat skills were being added! But as we hit the 3 year anniversary of... Not very much at all, do we even care anymore? Equally, should we? Some very obvious facts: Cube World is in its current state an alpha product. The base mechanics of the game itself were very well polished and remarkably so for an open world format, but the promise of an alpha is an unstable one. There was no guarantee of a “final release” of Cube World. Also Wollay and his wife, the duo behind Picroma, are first-time game developers with some history in programming. The game had a very high likelihood of being hung up, scaled back or re-imagined. However, Cube World’s status simply became incredibly unclear. 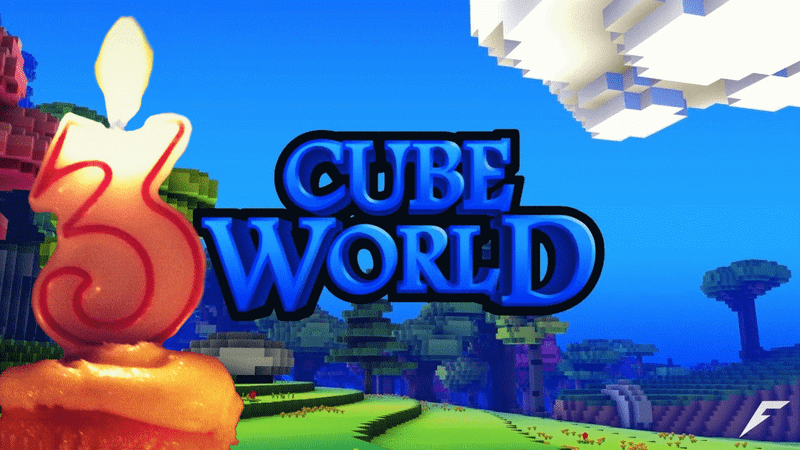 Cube World didn’t fall through the cracks, or suddenly see a cancellation. It just sat there in suspended animation. Emails and calls to the developer went unanswered, all social media associated with Picroma and Cube World stopped pushing updates, and the game’s community were forced to speculate about the status of their new favourite game. Picroma and Cube World’s history is a strange one, and is well worth catching up on here. But since then, Wollay has gotten back in touch, semi-regularly updates his Twitter and Instagram and keeps reassuring fans that Cube World is still coming. 3 years is a lifetime as far as technology goes. 3 years can be the difference between one generation of hardware and the next, and technology, along with the interest in it, waxes and wanes faster than in most other industries. Since Cube World alpha, we’ve entered a new generation of console hardware, and are beginning to see Virtual Reality enter the mass market. We’ve also come to find that as the internet permeates more and more of our daily lives, we expect to be consistently in the know. We can shoot off messages directly to our favourite public figures in the form of tweets and comments, and provided those public figures are small and/or humble enough, you might not be considered unreasonable to expect (or perhaps more correctly, hope for) a response, something that “Wollay” just isn’t known for. It might then come as no surprise that after 3 years and some very spotty communication between “Wollay” and the Cube World community, faith in the final product is markedly absent. The Cube World subreddit is perhaps now the most active Cube World community currently, but its relative activity compared to the game’s ambiguous state makes the atmosphere there all the more bewildering, if not a little bit hopeless. The mindset around Cube World now seems to be more one of curiosity than optimism; “Is [Wollay’s] twitter legit and actually him?”, “SO it says cube world registrations [are] currently disabled”, “In a [month’s] time we’ve been waiting three years for an update”. Cube World exists not as a game to look forward to, but as a topic to speculate. To wonder if it ever will receive an update. To marvel in just how long the game has gone without new content, and yet still it resurfaces in the public memory before promptly dissolving away again. The curiosity is only further compounded by the fact that updated mechanics are commonly being advertised, but for some reason aren’t ever pushed in incremental updates to the people who purchased Cube World years ago. So Cube World is still in development, but it’s time to stop caring. I won’t bother myself wondering whether or not it’s something I’ll return to in the future, and safely assume that it won’t be. Maybe Picroma will update Cube World, and it will resurface as a game that was well worth waiting for. Maybe Cube World is truly dead in the water, but “Wollay” simply enjoys creating systems and mechanics for it through bliss, or regret, or anger. Maybe Cube World never truly existed at all. Or maybe it’s simply a game that was announced far too early, and will come far too late. But it is coming. I just don’t expect to be around to know about it. UPDATE (02/07/2016): Changed the title and some wording of the article to reflect the passing of Cube World’s 3 year anniversary.